Cleaved Caspase-3 Staining Kit (Red) ab65617 provides a convenient means for detecting activated Caspase-3 in living cells. The assay utilizes the Caspase-3 inhibitor DEVD-FMK conjugated to sulfo-rhodamine (Red-DEVD-FMK) as the fluorescent in situ marker. Red-DEVD-FMK is cell permeable, nontoxic, and irreversibly binds to activated caspase-3 in apoptotic cells. Previously called Caspase-3 (active) Red Staining Kit. Microplate reader, Fluor. microscope, Flow cyt. The caspase family of cysteine proteases play a key role in apoptosis. Caspase 3 (also known as CPP32, YAMA and apopain) is the most extensively studied apoptotic protein among caspase family members. Caspase 3 is synthesized as an inactive pro enzyme that is processed in cells undergoing apoptosis by self proteolysis and/or cleavage by other upstream proteases (e.g. Caspases 8, 9 and 10). The processed form of Caspase 3 consists of large (17kD) and small (12kD) subunits which associate to form an active enzyme. Caspase 3 is cleaved at Asp28 - Ser29 and Asp175 - Ser176. The active Caspase 3 proteolytically cleaves and activates other caspases (e.g. Caspases 6, 7 and 9), as well as relevant targets in the cells (e.g. PARP and DFF). Alternative splicing of this gene results in two transcript variants which encode the same protein. In immunohistochemical studies Caspase 3 expression has been shown to be widespread but not present in all cell types (e.g. commonly reported in epithelial cells of skin, renal proximal tubules and collecting ducts). Differences in the level of Caspase 3 have been reported in cells of short lived nature (eg germinal centre B cells) and those that are long lived (e.g. mantle zone B cells). Caspase 3 is the predominant caspase involved in the cleavage of amyloid beta 4A precursor protein, which is associated with neuronal death in Alzheimer's disease. 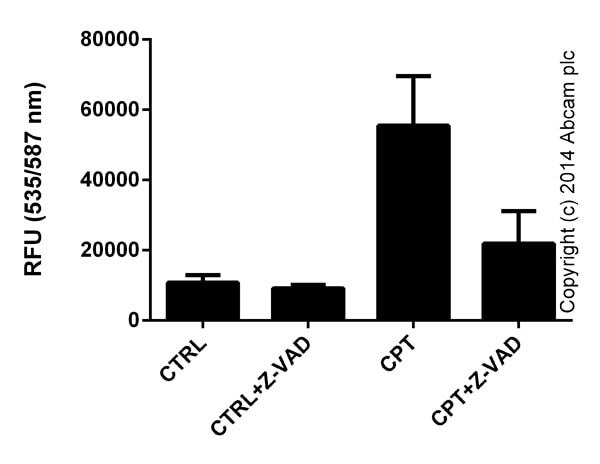 Caspase-3 activity in Jurkat cells (3 x10e5 cells) following 24 hour exposure to 2 µM Camptothecin (ab120115) with or without 50 μM caspase inhibitor Z-VAD(OMe)-FMK (ab120487). Background signal subtracted, duplicates; +/- SD. ab65617 has not yet been referenced specifically in any publications. Publishing research using ab65617? Please let us know so that we can cite the reference in this datasheet. There are currently no Customer reviews or Questions for ab65617.